Twentieth Knight of Kerry, C.V.O. Was born in 1844, and succeeded his father in 1880. 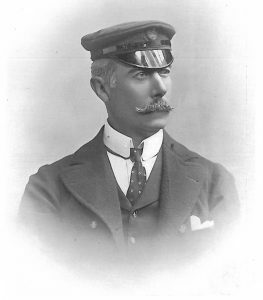 He was Equerry to the Duke of Connaught, and served in the Rifle Brigade from 1863 till 1883. He volunteered for special service during the first Ashantee War, and served through the campaign as A.D.C. to Sir Archibald Alison, being several times men­tioned in despatches. Sir Maurice purchased the racing cutter Satanita, 300 tons, in 1897, and raced in the Mediterranean in the spring of 1898-1899. The King, when Prince of Wales, was on board the Satanita on several occasions. Besides winning several cups, Satanita took £2,296 in prize-money. In racing off Cannes, she established a record for speed on two occasions. In the autumn of 1898 Satanita did the passage from Land’s End to Valencia (a distance of nearly 300 miles) in exactly twenty hours, in a gale from the north-east. The owner and his eldest son were on board, and the yacht carried her full mainsail all through the trip. 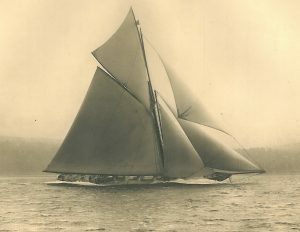 Satanita won the Queen’s Cup in 1900, the last cup pre­sented to the Royal Yacht Squadron by her late Majesty Queen Victoria. In 1906 Satanita established a record at Cowes by winning the King’s Cup and the German Emperor’s Cup. The Prince of Wales was on board during the race for the King’s Cup, and the prize was presented personally by His Majesty. Besides Satanita, Sir Maurice owns other smaller sailing craft, including Zelva, Nighean, and Raffles. Sir Maurice FitzGerald’s colours, cherry jacket and black cap, are well known on the turf, and have been carried successfully by Heir Male, Ellen Bean, Dosia, Sister Angela, White Prince, Sweethampton, The Cherub, and others. Clubs: Royal Yacht Squadron, Royal Alfred. Residences: The Severals, New­market ; and Valencia Island.